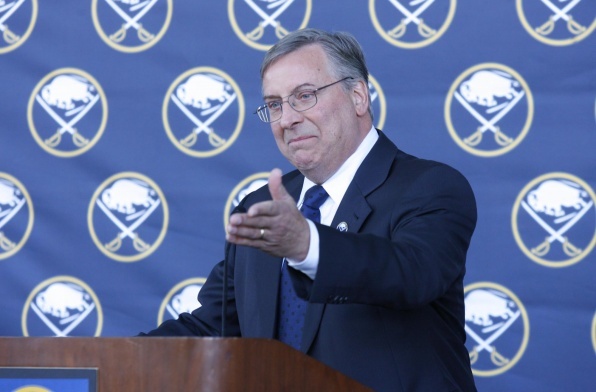 When I first heard that Terry Pegula had interest in the Sabres I was cautiously optimistic. So often you hear rumors, more often than not they are completely ridiculous. I credit getting hooked on this story to the reporting that Bucky Gleason did on staying up on the entire process. After watching yesterday’s press conference I have never felt more love for the team I have followed for longer than I can remember. Don’t get me wrong, Tom Golisano, Larry Quinn and Dan DiPofi deserve more credit than they are getting for what they have done for this team, the fan base and the city. However, Terry Pegula is cast from the perfect mold to be an owner of a sports franchise. He came out and said it, he wants to run the team to win the Stanley Cup. It seems to me that he understands the concept of deep playoff runs = more money. What is the most exciting is that Pegula comes off as just another Sabres fan……..who happens to have a whole lot of money. It is obvious that he is a family man who clearly has a passion for the sport and the team. He cried when he told Gil Perreault he was his hero, find me a better guy to own this team than that. Not only does Pegula love this team, he wants to do what it takes to make them a winner. He spoke about adding money to the scouting department, adding more support for Darcy Regier, adding features to the locker room and basically making Buffalo a destination for free agents. These points are what makes me excited. He knows that he needs to have the ability to attract top-flite players and he also needs to unshackle his hockey department, so that they can identify the best players. It seems to me that he and his advisers have the right vision for the future. I just can’t wait to see the results. Next Article Lets chat about the in-arena experience, shall we?